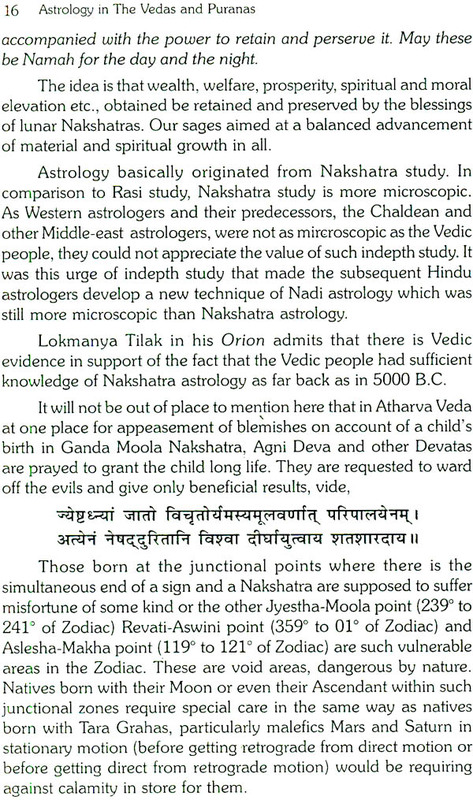 Astrology is said to be one of the six limbs of the Vedas. 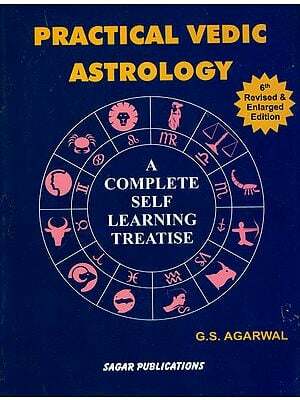 Unfortunately, very few attempts have been made to discover matters of astrology present in some for or other in the Vedas and other ancient scriptures in a systematic manner. Late Dr. B.V. Raman, founder President of the Indian Council of Astrological Science and founder editor of the Astrological Magazine seeing my research interest in ancient scriptures inspired inspired me to fill in this void. Accordingly, I made research on the Vedas, Vishnu Purana, Shrimad Bhagawat Purana, Koorma Purana, Mahashiv Purana, Valmikiya Ramayan and the Mahabharata. 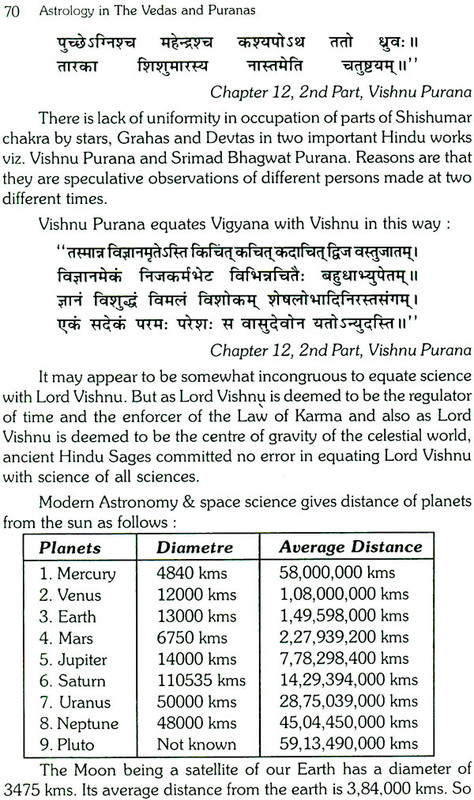 My research on the Vedas and Shrimad Bhagavat Purana were published in consecutive issues of The Astrological Magazine while my research on Vishnu Purana was published in consecutive issues of BABAJEE. 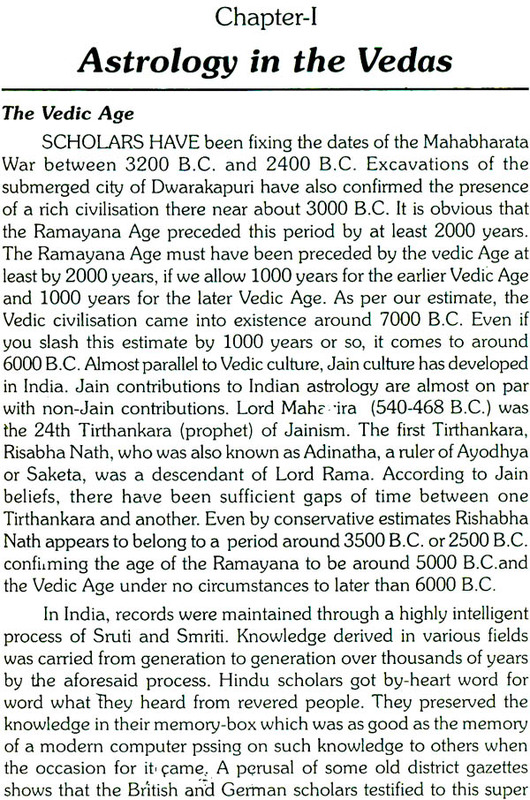 My research works on Maha Shiv Purana, Koorma Purana, Valmikiya Ramayana and the Mahabharata were published in consecutive issues of The Times of Astrology. I am gateful to learned gracious editors of the two great magazines The Astrological Magazine and BABAJEE, that it Mrs. Gayatri Devi Vasudev of The A.M. and Mr. Lachchman Das Madan of BABAJEE for allowing me to use materials published in their journals in this regard in the form of a book for the benefit of readers. The book in the hand covers three chapters only. 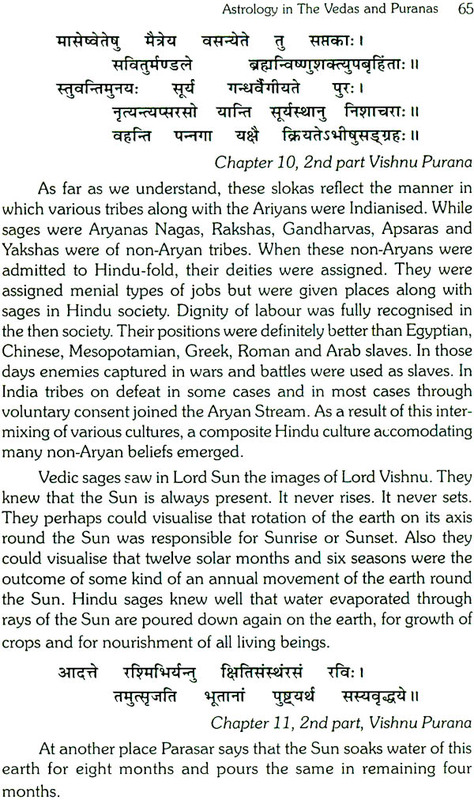 Chapter one deals with seeds of astrology as found out in the Vedas. 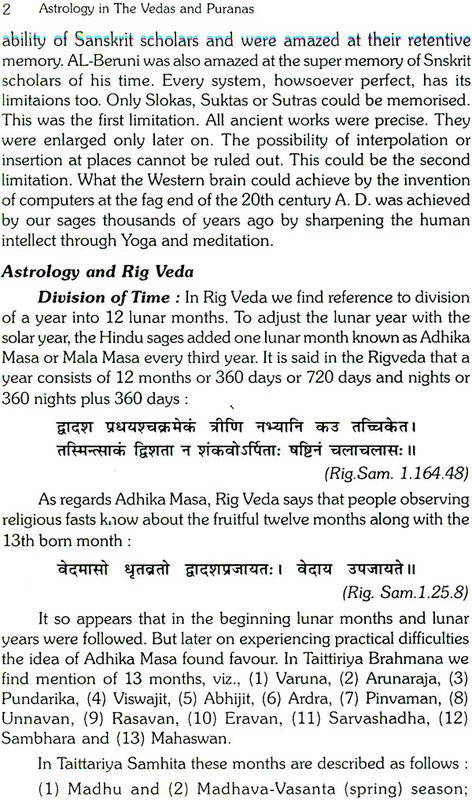 It brings to light some unique scientific achievements of the Vedic Age such as Law of gravitation. It also deals with Vedanga Jyotisha. 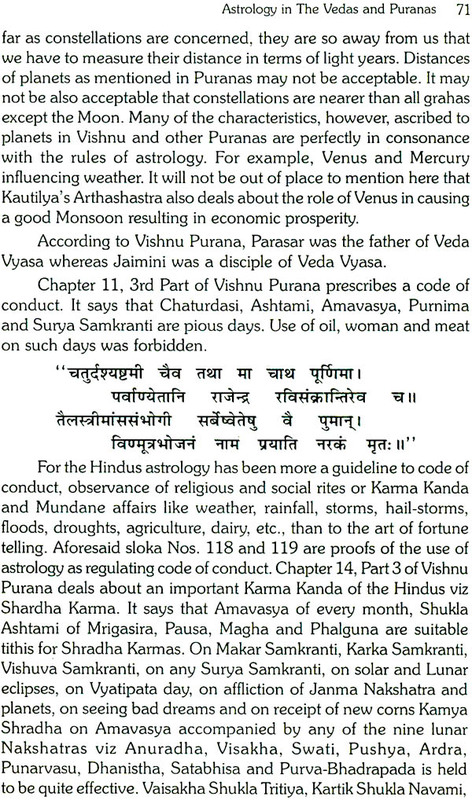 Chapter two deals with matters of astrology as enshrined in Vishnu Purana. 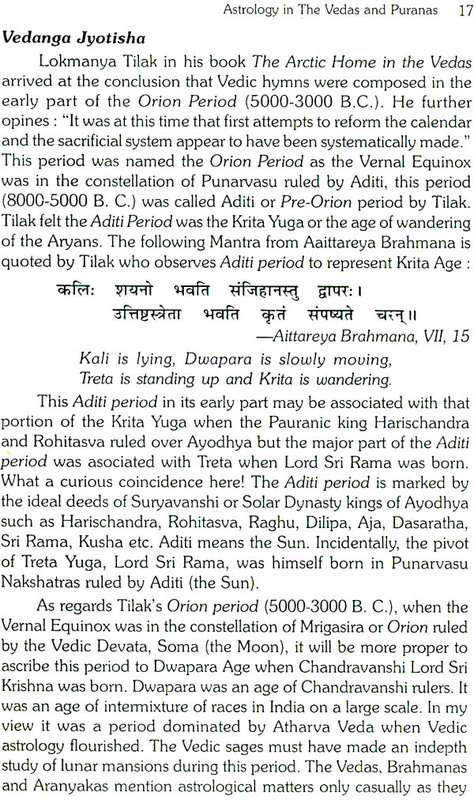 It deals with Nine Grahas, Unit of Time, Nakshatras, Rashis etc. 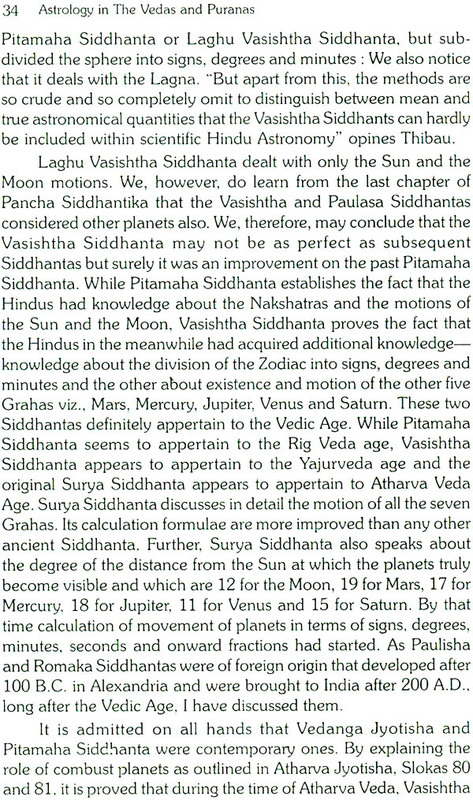 Chapter three deals with philosophical base of Astrology as enshrined in Shrimad Bhagwat Purana. Earlier no such book was ever attempted. 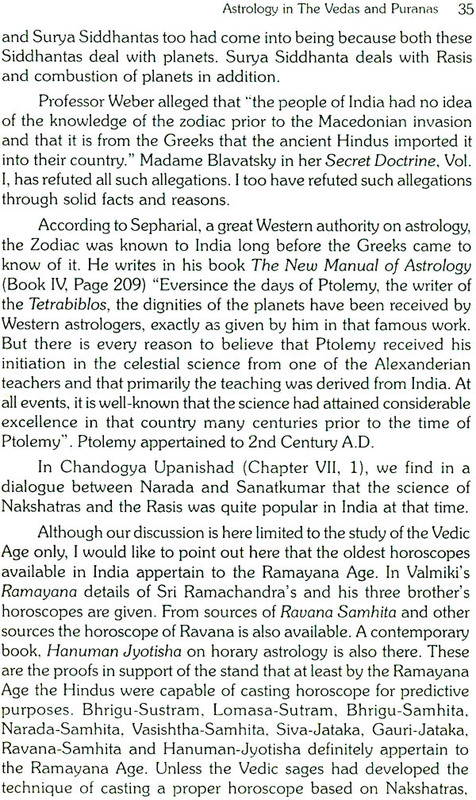 I owe gratitude to ALPHA PUBLICATION of Delhi for taking interest in publishing this genuine research-work on astrology for the benefit of readers. This book is dedicated to late Dr. B.V. Raman, who groomed me as an astrology and who also inspired me to search out seeds of astrology enshrined in our ancient scriptures. Author of "Astrology in the Vedas and Puranas" through his wit and profound scholarship has proved beyond reasonable doubts through the help of Vedas and Puranas that Indian Astrology has its roots in India. 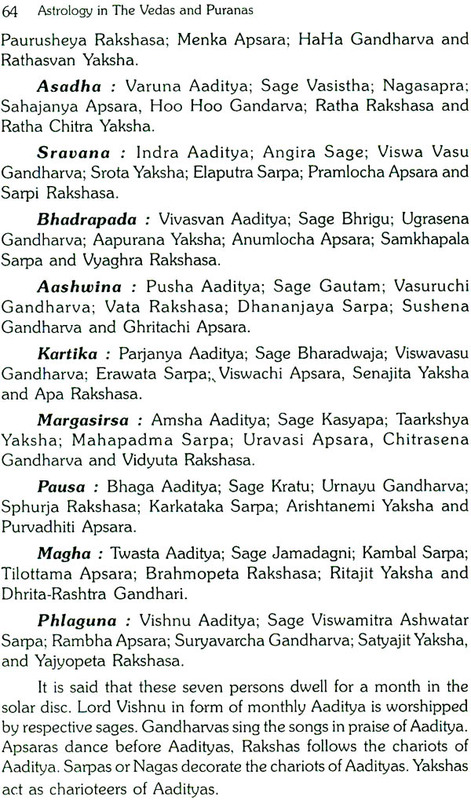 Our sages discovered Grahas, Nakshatras and their influences on mankind and the world. Our ancient sages were more believers in commencing new works at auspicious hours commensurate with favourable planetary vibrations than believers in fatalism. 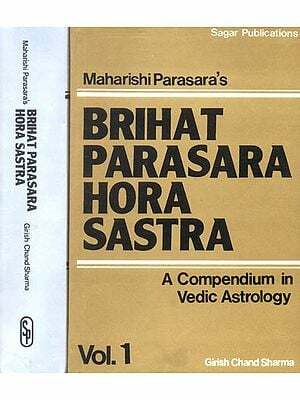 Present book deals with astrological inputs available in the Vedas, Vishnu Purana and Shrimad Bhagawat Purana. Lovers of Vedic cultural heritage must have a copy of this historic book. Author of book Shri K.K. Pathak is quite a well-known figure in the astrological circle since last more than thirty-five years. He has secured a record achievement of getting published his articles in more than four hundred issues of leading astrological journals namely The Astrological Magazines The Times of Astrology Babaji and Express Star-teller. Pathak jee has authored more than thirty books after attaining the age of 65 years. Twelve of his books have already been published by Nishkaam Peeth Prakashan of New Delhi. Alpha publication of Delhi has since come forward to publish his remaining books for benefit of readers. Pathak jee was conferred upon the honour of JYOTISH BHANU in year 1998 by Indian Council of Astrological Sciences in recognition of his services to the cause of Astrology. He was further conferred "SANTHANAM AWARD" in the year 1999 for his distinguish shed works. Pathak jee is held to be an expert I Remedial Astrology. Astrology Metreology, Vedics Pauranic Astrology, classical works and Dasha system. Pathak jee belongs to Bihar. He was in Administrative Service for 33 years andretired as Special Secretary to the Govt. of Bihar in October 1993. We wish him a long life. wanted to know the actual time of birth. Is it not when Atma resides in the womb.